What’s Trending? 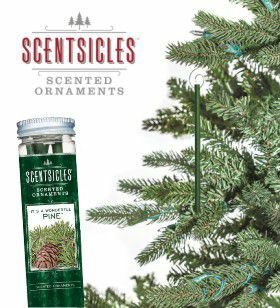 Make your artificial tree smell real, with Scentsicles! Make your artificial tree, wreath, or home “smell like Christmas” with Scentsicles. These easy to use ornament stick are insured with wonderful Christmas scents that are sure to make your holidays smell more holiday-ish! Simply hang a few of them on your tree, or bury them inside of centerpieces or wreaths. The scent will slowly permeate into the air without being over overpowering. If you would like more scent, simply put a few more out. If you would like less, remove a Scentsicle. They are available in 4 holiday scents, which include Pine, Winter Fir, Spruce, and Snow Berry Wreath. Each jar comes with 6 stick so that you can spread around the house. The jar is resealable, so if you want to hold on to them for next year, that is no problem either. If you are looking to add the smell of Christmas without the mess of a live tree this year, try Scentsicles. The quick and easy way to make your holidays, “smell like Christmas”. It's the holiday season and Santa and his Reindeer are decorating their tree for Christmas. Although the tree is beautifully decorated, Santa realizes that something is missing when his Reindeer offers him Scentsicles. As they both breathe in the fresh-cut scent of Scentsicles, it starts snowing and Santa and Reindeer know that they are now ready for Christmas.